Well, to say it has been awhile is an understatement. Life has been crazy busy. I am making this blog a priority again which means you will get updates on all my current projects. Furthermore, I have been on Instagram a lot watching @WestKnits live videos. He is inspiring me to just roll with the punches and keep doing you. SO … that is what I am going to do with this blog. My current project is an awesome shawl pattern called The Shawl With No Name by Darn Knit Anyways in Stillwater, Minnesota and is one of the yarn stores I now frequent. What drew me to this pattern was the fact that there are two different versions and it seemed like an easy pattern since there are no other techniques besides garter stitch and slip stitches. I wanted to do a bright colored shawl. It took some time to decide which way I wanted to go with for colors. I could not decide if I wanted to try doing a neon colorway or stick closer to my normal yarn colors, but make the color combination accent and bring out each other. I ended up going with a dark purple, lime green, and rusty orange colorway. I chose to do the slip stitch sequence because I liked how it added a finesse to the knitting without a ton of skill or time. I do not know about you, but when I have a problem that has developed with my knitting, I tend to get pouty towards the project. I try to fix it, I give it a few days break, then I put it on hold if I still cannot fix it. I had reached this point in the project since I ran out of one of my colors 2 rows shy of finishing with that color! *UUUGGGGHHHH* I thought I would just end that color early and switch to the next color two rows early. Thinking I was pretty clever, I knitted on….until that color started running out too. Seriously, this problem is starting to work more than just my patience. One of the reasons I will be going back to Darn Knit Anyways is because I brought in the shawl in a frustrated state and they took the time to unravel and help me fix the shawl to be back on track. Frankly, if I had not done this, this shawl would be frogged and who knows how long this would be sitting around in my basement. I am at least 80% done with the shawl. I love how it looks and feels. I will post an update once I am finished. But, here is a picture of where I am … courtesy of my Instagram. Have you knitted a project that you know was done perfectly then blocked it and all the sudden you have holes!? To your horror, you start googling to find a solution. Yet, no one seems to understand or have a fix to your current panic attack? Calm down. I have an easy solution to this that does not require any scissors, ripping out your finished project. It requires a blocking mat, pins, your finished knitting project, and a knitting needle of your choice. Step 1: Block the whole project and make sure to re-wet the project. If it is to large to block the whole project, block half the project where the hole(s) are. 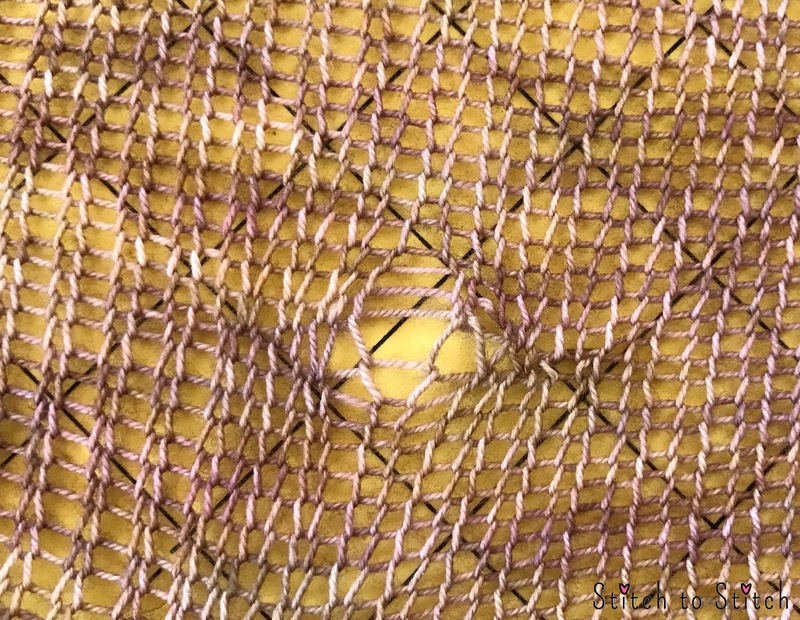 Step 2: Using your knitting needle, spread out the stitches around the hole to tighten the hole us. See video below. Step 3: Take a damp washcloth and re-wet the blocked project. Allow to throughly dry and then unblock. I admit, I didn’t pick up the second clue until Saturday night. But, I did finish the entire clue that night! This German Short Row Heel did take me a couple tries which meant I had to ripe it back a couple of times. I wish the author would have said to practice before attempting this since it takes a couple times to get use to what you are doing. I had meant to start my second sock last week but life got in the way. Hopefully, with the extra time this week, I will be able to start the second sock. 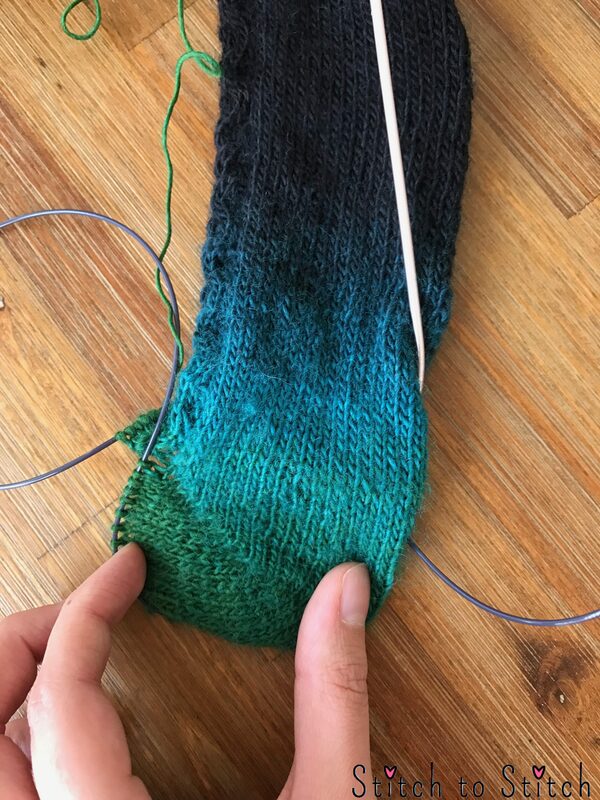 How is your KAL sock coming? I decided that since I have been a knitter for well over ten years and I have not done a single knit along (KAL), that this was despicable and I just had to do something about it! My local knitting group informed me that Knit Purl Hunter does some amazing KALs and will be releasing a new one very soon. So I quickly went to her website, summed up what supplies I needed, and was off to the yarn store. I fell in love with this Zauberball color because it reminded be of my elementary school days. I thought, “How fitting for my first KAL!” I was fortunate enough that my local yarn store was offering ten percent off any knitting supplies for this KAL. I know some knitters will cringe while they read this, but I stopped by my local Joann Fabrics to pick up two circular 30″ needles of the 2.75 mm size. Side note: My husband lost his job back in May and with me still being in school, I just cannot afford the luxury of Addi Turbos knitting needles right now. But I look forward to the day when I can knit with ease on those sweet babies again! Anyways, I waited anxiously for October 6th to arrive so I could start these socks because I have never knit socks toe up before. I always knit from the leg down to the toes. As soon as the first part of the pattern was released, I was off to the knitting races (so to speak). I quickly found the pattern to be well written and fairly easy for a new or advanced knitter. I finished my first sock this past Sunday. I plan on finishing the second sock by this Thursday when the second part of the pattern is released. By the way, it is not to late for you to join in on the KAL! I found and bought two skeins of sock yarn by from Schachenmayr called Regia Pairfect that I was determined to make for myself. Well, a year has passed, and I am finally getting around to these two skeins of yarn! I decided to knit the Regia Pairfect wood color skein first. I was drawn to the pinks, purples, and blue in the yarn. 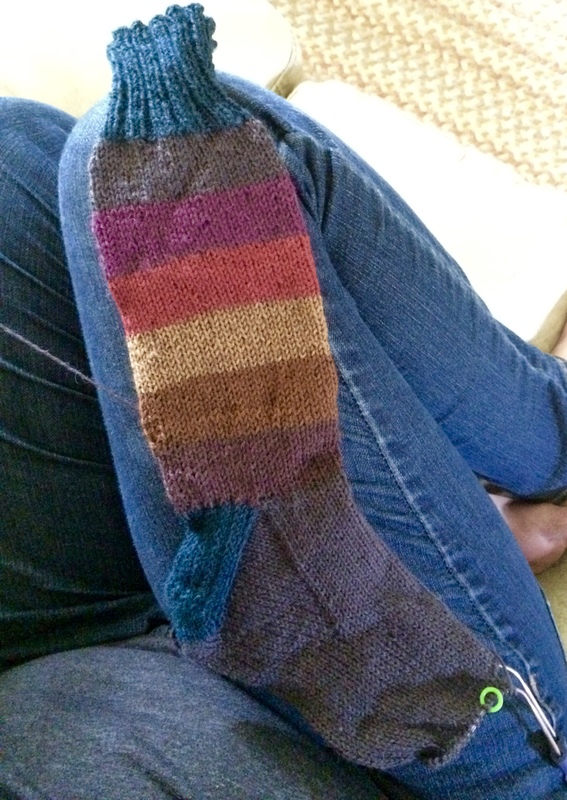 Well, lets just say, it has pretty much taken me the entire month of June to get one sock out of the pair done … and I still need to finish the toes on the first sock! 😈 Even more frustrating, this sock has been ripped out and redone 5 times this month! I have come to find out that I have VERY, very narrow feet. This last time, I only put 48 stitches on the needless! Then, to the brown strip right before the heel, I decreased every 12 stitches to give me a grand total of 42 stitches. Not going to lie, I felt like I was knitting a child’s sock for my own feet! I am finally down to decreasing to the toes and I found out I do not have the right size DPNs to finish the sock at the moment, so I just started on the second sock.